Nivea has answered every lazy girl's prayers (oh, and let's not forget those lazy boys!) 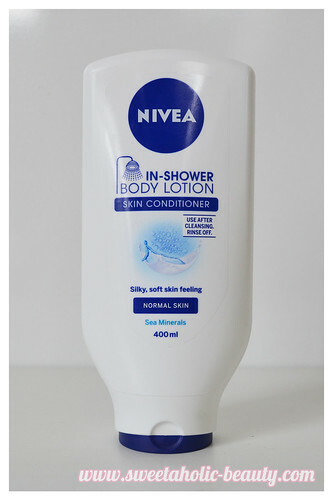 by creating my new favourite shower product ever; the Nivea In-Shower Body Lotion Skin Conditioner. Yes, it's exactly how it sounds - it's body lotion you can apply in the shower! The Skin Conditioner comes in a handy upside down tube (my favourite for showers) which means it will be easier to get every last drop of this baby out of the tube! My skin is fairly normal and not overly dry already, so I opted for the Normal Skin variety. You can also get a Dry Skin version, which is in the dark blue tube. The smell of this is classic Nivea. I have no other way to describe it. 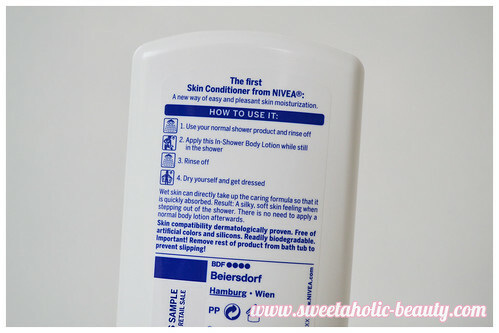 I love Nivea products; but I love it even more than they smell the same! There's a real sense of familiarity and comfort when I use a new product that smells the same as my toner! See what I mean about the instructions! Dummy proof! The actual product is a lightweight moisturiser slash body wash. It's caught somewhere in between the two, which makes it an absolute delight to apply to my skin! I let it soak in for a few seconds before washing it off, and voila! You're done! At first I didn't notice anything different. Yeah, my skin feels smooth. But doesn't it always in the shower? It wasn't until I actually got out and dried off, I realised that my skin was feeling really soft, as if I'd already applied a moisturiser! This makes my life a lot easier, especially because I work night shift, and by the time I get home and shower, I just want to hop into bed! (Sorry but moisturising takes too long sometimes!) Sometimes on the weekends I'm naughty and use this - and moisturiser - and my legs feel amazing! 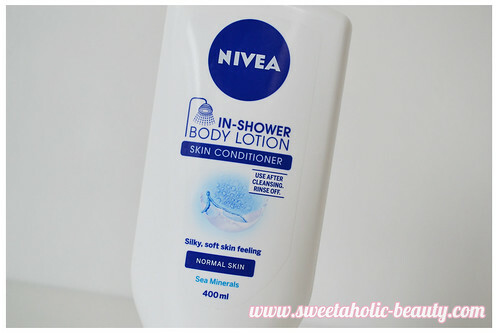 Have you tried the new Nivea In-Shower Body Lotion Skin Conditioner yet? If so, what did you think? If not - why not!? I would love to try this and after reading this I have to give it a go! I heard about this from the UK beauty girls! It sounds so good because I am so lazy with moisturiser and often forget about it altogether! This is definitely on my shopping list. I have tried this one and also the blue one for dry skin, and although I don't have dry skin, I much prefer that one. Great product for when you're in a hurry!